The Fellowship was fortunate enough to obtain a copy of SONITUS #1 from Alterna Comics. The story is written by Cody Sousa and Dan Sheppard; with art by Cecilia Lo Valvo, colors by Dee Cunniffe, and lettering by Dezi Sienty. After being away for ten years, a young man returns to his hometown. He visits an abandoned house that he and others hung out in when he was younger. While investigating, he reflects about all the times he spent at the house. A noise from upstairs gets him to witness a ghastly sight, but is it real? What is causing this sound that he constantly hears; made worse by returning home and to this house? Is there some kind or twisted bond between them? Cody Sousa’s CROAK (also from Alterna) was a great horror miniseries from last year, so when this was announced I was excited. While an intriguing start, I was expecting a little more tension or suspense. Cecilia Lo Valvo, Cunniffe, and Sienty provide an unique visual which may not be everybody’s cup of tea; but was very striking. It will be interesting to see where the story goes. Worth checking out. 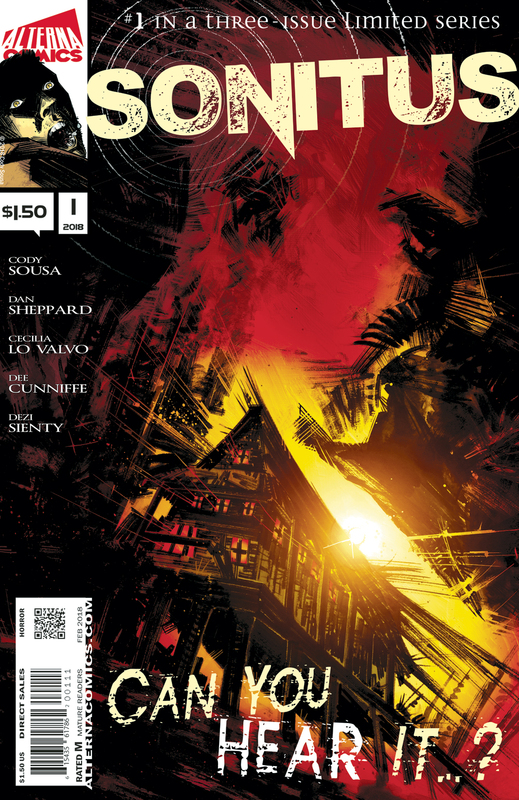 SONITUS #1 is in stores now or available at www.alternacomics.com.